*Pioneer is a certified manufacturer for the New York City School Construction Authority (NYCSCA). Vincent J. Amato Jr. founded Pioneer Window Mfg. Corp. in 1994 after more than a decade in the window installation business in the highly competitive New York City market. Mr. Amato applied his vast knowledge and experience of the window installation business to the manufacture of superior windows, doors, curtain walls, storefronts and other related architectural aluminum products. Thus, when you choose Pioneer, you can be confident that you are working with a manufacturer that understands the needs of the installer as well as the end user. Dependability and consistency. Unlike other window manufacturers, Pioneer serves you and your project from start to finish; offering a complete package of products to meet your architectural aluminum and glazing needs. Pioneer's in-house staff designs, engineers, manufactures and delivers all its own products. Delivery is prompt, complete, safe and made via Pioneer's own fleet of trucks driven by Pioneer employees. Pioneer's 175,000 square foot manufacturing facility is located in Johnstown, New York; just hours from the New York City metropolitan area as well as Philadelphia, Boston and all points along the East Coast. Our manufacturing facility houses state-of-the-art equipment that allows Pioneer to lead the industry with higher performing products and shorter lead times. Pioneer also operates its own fully accredited in-house performance test chamber. 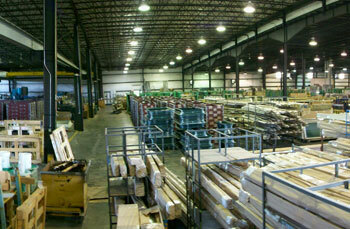 Pioneer manufactures a wide selection of architectural aluminum products.